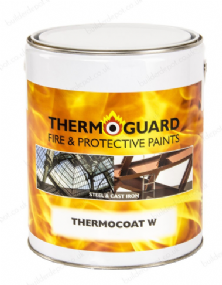 Thermoguard Thermocoat W is an economical, water based white intumescent fire proof retardant paint coating providing a fire resistant coating to structural steel & cast iron for up to 120 minutes - 2 hours with a minimum number of coats. Available in a white matt finish as standard in 2.5kg, 5kg & 20kg. Product performance assessment based upon UKAS/NAMAS Fire Test Laboratory Certification to BS 476 Part 21 - Fire resistance to load bearing elements of structures. Apply Thermocoat to achieve fire resistance in accordance with the instructions provided by the technical department. When steel is visible or subject to variable or damp atmospheric conditions, apply 1-2 coats (dependant on specification) of Thermoguard Flame Retardant Eggshell Topcoat or Thermoguard Flame Retardant Gloss Topcoat.